Home » Law In Travel » Thuggish Former United Gate Agent Suing the Man He Assaulted! Thuggish Former United Gate Agent Suing the Man He Assaulted! People hate lawyers because they agree to take cases like that of Anastasia’s. 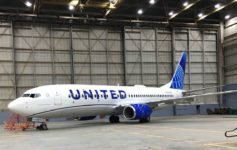 Alejandro Anastasia, the former employee, is now suing for $1 million, saying he was assaulted by the passenger and that United failed to provide proper training and a safe work environment. I know my bias is clear, but I find Anastasia even more disgusting after watching this. Let’s say Ronald Tigner, the victim, did in fact shout profanities and use racial slurs as Anastasia alleges. That gives him no license to react violently. Anastasia said he outstretched his arms and backed away after Tigner “got in [his] face” and stepped on his toe, according to court documents. He tells NBC News he took a step back, but the video clearly indicates he is lying. He did not step away, he stood his ground and shoved Tigner to the ground. Sorry, but there is no argument over that. If this was an accident, as alleged, why didn’t he help Tigner up? And isn’t his very role as a “customer service” agent to de-escalate situations like Tiger? He’s suing United as well, claiming that the airline did not provide him proper training. Do we need a special class teaching us not to shove people down? I’m disgusted by this story. It makes my blood boil, just like it did last time I wrote about it. People don’t always need more training: they just need to understand that their are consequences for their actions. Next Article Would You Turn In Your Seatmate to the Cops? The story presented by the employee is not supported by the chain of events. If a check-in agent provoked an anger prone pax, the said pax would have become hostile at the counter desk. Once the pax was on the floor, a call for assistance would have followed to document injuries and protect from further injury. A supervisor would have been summoned by the employee. A police report filed by employee and manager with copy to risk management office. If a story sounds unlikely, it probably isn’t true. 5. If United try to settle the claim from Tigner for whatever reason, Anastasia could hope that he is involved. He may or may not gain a penny. But he will try at least not have to pay against Tigner, and possibly United. 6. By counter claiming, he tried to at least keep this issue a civil claim, not criminal one. Lastly, while it look politically incorrect, I believe lawyers have the obligation (officium nobile) to give legal advice/assistant to whoever seeks justice. Whether it is right or wrong, its for the court to decide. You’re a JD, surely understood this. Your points have a good bit of validity, except that what the scum is seeking is not justice, he’s seeking to escape any consequences for his cowardly actions. I mean in the point of view of the lawyer, Anastasia is trying not to be sandwiched between Tigner and United. Since at the moment of incident he was employed under United. And off course, we all know lawyers have thousand of justification to defend even a serial killer. Tough mostly simply do it for money or popularity…. Heartily agree Matthew. Though it is very difficult to respond calmly to verbal abuse and threats, responding with physical violence is not justified, especially when this elderly man was not a physical threat to Anastasia. I also agree he needs to man up and accept the consequences of his actions. Even if there are reasons, even strong reasons for our responses, people must be responsible for how they act. I totally agree with the poor hiring procedures on UA’s part and the IAM protecting troublesome employees (United also is too concerned about politically correct issues, “protected” groups, etc.) ……but I disagree on the “poor training” part. I don’t know what background Anastasia comes from but maybe in his household, his parent(s?) used brute force or a lot of yelling and screaming to “discipline”. United should not have to become social workers for their employees to “train” them in basic common sense and decent conduct. I mean you kind of learn in kindergarten to play nice, not hit others, etc……..STARTS.IN.THE.HOME.IN.CHILDHOOD.